Times Square has turned into a towering strip mall featuring the chains you can find in every city in America- Olive Garden, Red Lobster, Applebees, etc. If you are visiting New York City, I urge you to save your appetite for one of the MANY delightful, unique, and delicious restaurants located just a few blocks away. Because really, did you come all the way to New York to eat the same stuff you eat back home? By venturing off the strip mall that is now 42nd Street and Times Square, not only will you have an authentic, one of a kind New York experience, but you’ll probably save a bunch of money on those inflated chain prices. Here are some of my top recommendations located within two or three blocks of all the major theatres and attractions of the famed Times Square. If you love Thai food, New York City is the place for you. There must be at least one Thai restaurant on every block of Midtown West/Hell’s Kitchen. I can’t limit myself to one so let me recommend a few. Now a staple of midtown dining, Yum Yum Bangkok has several locations all within a few steps of one another. With satisfying Thai food and an excellent lunch specials, you can’t go wrong with this classic. Not much for atmosphere, but my absolute favorite pad Thai in all of New York City. Pam Real prides itself on the authenticity of its cuisine. For a twist on Thai, enjoy a meal at this fusion French/Thai restaurant. My personal favorites are the wild mushroom dumpling appetizer and the butternut squash ravioli. Sit at the bar for all day happy hour on a selection of delicious cocktails. Fresh hummus, couscous, and baklava make hummus kitchen a flavorful and healthy option for a midtown meal. They also make my favorite sangria in town as well as a sweet hot apple cider brandy. A combination of Balkan and Mediterranean cuisine, Balkanika has a range of tasty dishes, especially for vegetarians, vegans, and the health conscious. Top off the evening with a pot of fondue and a selection from the wine bar. For upscale American at a reasonable price point try Eatery. Gourmet comfort food combined with a chic and lively atmosphere makes Eatery a treat for anyone. This celebrity owned BBQ joint is a neighborhood favorite. The co-owners of the restaurant sought to bring a little taste of Memphis to NYC and now people from all over the world are checking out this southern inspired hot spot. 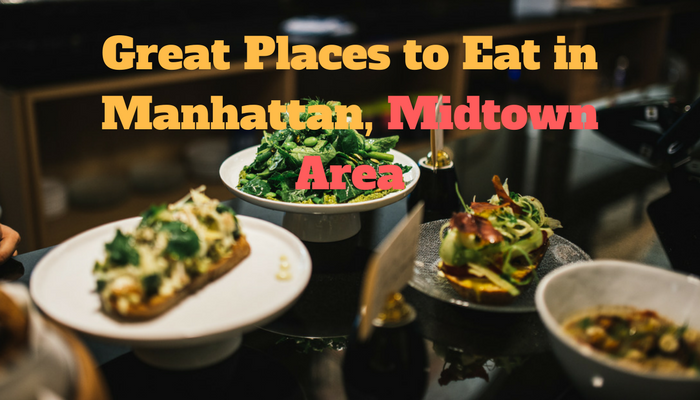 Someone could write a book on all the great restaurants and cuisines in midtown. If I didn’t get a chance to cover your favorite here, please share! FREE newsletter contains the latest information about New York goings on.